I was surprised when a dear friend once introduced me to a group of homeschool moms as “a woman I’m so impressed with because she and her family eat dinner together every night!” That struck me so funny! I thought everyone did that! My husband and I grew up when it was the norm for families to gather ’round the table every night and enjoy a family meal. We talked and laughed, swapped stories about our day, enjoyed a good meal, and created wonderful memories. This tradition was one we were determined to pass down to our kids and to this day remains a constant joy. Good food, family, and friends…does life get any better than that? Today’s busy schedules often tend to shove the family table aside, but it’s time we homeschool families slid it back in place. Recent studies have shown that kids who eat five or more regular meals a week, at home, with their family are happier, healthier, more secure, and self-confident. They also do better in school, have improved vocabulary and conversation skills, and are less likely to be obese, smoke, drink, do drugs or get pregnant. Who knew? I thought we were just having fun! Where else can you spend 45-60 minutes a day and get those kinds of results? As a busy, homeschool mom I found mornings to be the best time to prepare dinner. While the kids did chores, practiced piano, or started their schoolwork I prepped and refrigerated that night’s dinner. If I didn’t, the day was gone before I knew it and the last thing I felt like doing at 5:00 or 6:00 was starting dinner. This way all I had to do was slip it in the oven and heat up a can of veggies! Done! The crock pot, ever my faithful companion, has always stood ready at a moments notice. A big pot of soup is a handy go-to, and a double-batch of anything eaten one night and popping the rest in the freezer for later is the perfect solution for those busy road-school days! 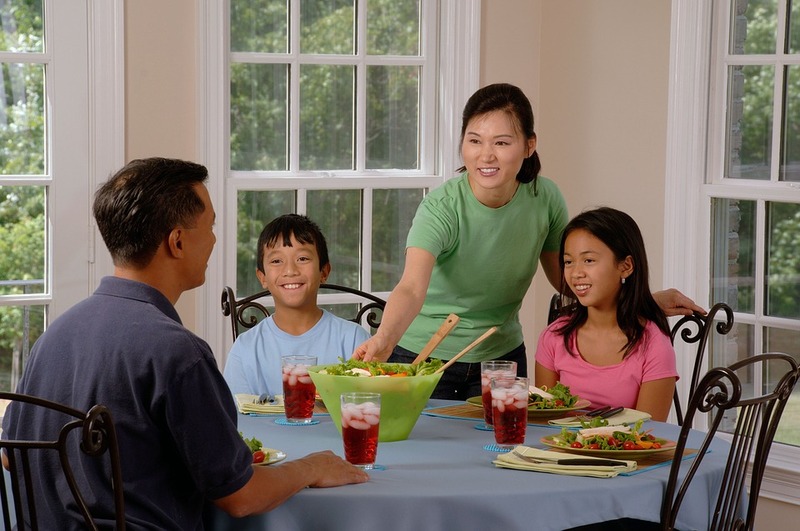 But, what if your schedule doesn’t allow for eating dinner together on a regular basis? No problem! Just pull yourselves up to the table for a leisurely breakfast or lunch. Either way, the family table should be a place of refuge, so save the “tough conversations” for another time and just enjoy each other’s company. But, don’t forget to unplug. The family table is all about YOU! This entry was posted in Homeschooling and tagged crock-pot, dinnertime, freezer meals, the family table. I totally agree! I love our family dinners. Even the grown kids come by regularly for Sunday dinner. It is the most wonderful time for family friendship. My youngest, a teenager, may protest occasionally, but he usually is right there joking and laughing with us. I don’t do Sunday dinners yet but am hoping to once my youngest and his wife move back…I have my Sunday Dinner cookbooks ready and waiting!